Twitter’s down for the count. What are we going to do about it? Hopefully you’re not sick of hearing about Twitter, Inc’s trademark woes (and yet another alliteration) because yes, they’ve been at it again. Conceding that the USPTO has successfully torpedoed their trademark on “tweet” but otherwise undeterred they’ve just tried to lay claim to the more specific term “retweet” (#77804841). While admittedly more distinctive (and therefore less problematic from a legal point of view), let’s not forget that they recently came under fire from developers for unjustly suspending retweet.com‘s @retweet account, having announced plans for an official retweet function of their own (more on Project Retweet at Mashable). This functionality could well prove as important for microblogging as Google’s PageRank did for Internet search and it’s definitely not the sort of thing we want to have locked up with a single provider. The idea is that it provides a way to value a user’s contribution based on how many people (and who) retweet a user’s tweets (a TweetRank, for want of a better name). So what’s the problem with Twitter, Inc registering “retweet” as a trademark? It’s not theirs to register, that’s what. That’s right, the “gesture and syntax of retweet was invented by users” and even Twitter’s own web interface still lacks the very functionality they are trying to take control of (and will for weeks to come no less). The retweet “micro-convention” has been meticulously documented and extensively discussed by active twitterers (twits?) who have gone so far as to write an essay on retweeting etiquette. Nothing I have seen anywhere credits Twitter with the invention of the retweet (which according to Google Trends took off at the start of this year) and in my opinion asking the authorities to remove this term from the public lexicon is nothing short of highway robbery. What does RT, or retweet mean? RT is short for retweet, and indicates a re-posting of someone else’s tweet. This isn’t an official Twitter command or feature, but people add RT somewhere in a tweet to indicate that part of their tweet includes something they’re re-posting from another person’s tweet, sometimes with a comment of their own.Check out this great article on re-tweeting, written by a fellow Twitter user, @ruhanirabin. So there you have it, even Twitter admit the idea isn’t theirs, defining it as a verb (another sure fire way to destroy a trademark) and then referring to a user article for more information. Of course that won’t stop them claiming it as their own now with a view to preventing competitors from delivering it themselves. To put things in perspective that’s about as reasonable as Google claiming ownership of our ideas because they’re in their index. Retweet.com, the Retweet.com logo and other Mesiab Labs trademarks including service marks, and product and service names are Mesiab Labs trademarks or registered trademarks in the United States and in other countries (the “Mesiab Labs Marks”). All other names and designs may be trademarks of their respective owners. Users may display or use the Retweet.com and Mesiab Labs Marks only in accordance with Mesiab Labs Trademark Use Guidelines. Here’s hoping they (or one of the many other retweet sites) file an opposition to the trademark when the appropriate time comes. Yesterday I apparently struck a nerve in revealing Twitter’s “Tweet” Trademark Torpedoed. The follow up commentary both on this blog and on Twitter itself was interesting and insightful, revealing that in addition to likely losing “tweet” (assuming you accept that it was ever theirs to lose) the recently registered Twitter trademark itself (#77166246) and pending registrations for the Twitter logo (#77721757, #77721751) are also on very shaky ground. Before we get into details as to how this could happen lt’s start with some background. A trademark is one of three main types of intellectual property (the others being copyrights and patents) in which society grants a monopoly over a “source identifier” (e.g. a word, logo, scent, etc.) in return for being given some guarantee of quality (e.g. I know what I’m getting when I buy a bottle of black liquid bearing the Coke® branding). Anybody can claim to have a trademark but generally they are registered which makes the process of enforcing the mark much easier. The registration process itself is thus more of a sanity check – making sure everything is in order, fees are paid, the mark is not obviously broken (that is, unable to function as a source identifier) and perhaps most importantly, that it doesn’t clash with other marks already issued. Trademarks are also jurisdictional in that they apply to a given territory (typically a country but also US states) but to make things easier it’s possible to use the Madrid Protocol to extend a valid trademark in one territory to any number of others (including the EU which is known as a “Community Trademark”). Of course if the first trademark fails (within a certain period of time) then those dependent on it are also jeopardised. Twitter have also filed applications using this process. Fanciful marks are created specifically to be trademarks (e.g. Kodak) – these are the strongest of all marks. Arbitrary marks have a meaning but not in the context in which they are used as a trademark. We all know what an apple is but when used in the context of computers it is meaningless (which is how Apple Computer is protected, though they did get in trouble when they started selling music and encroached on another trademark in the process). Similarly, you can’t trademark “yellow bananas” but you’d probably get away with “blue bananas” or “cool bananas” because they don’t exist. Descriptive marks describe some quality or characteristic of the product and are unregistrable in most trademark offices and unprotectable in most courts. “Cloud computing” was found to be both generic and descriptive by USPTO last year in denying Dell. Twitter is likely considered a descriptive trademark (but one could argue it’s now also generic). 1. to utter a succession of small, tremulous sounds, as a bird. 2. to talk lightly and rapidly, esp. of trivial matters; chatter. 4. to tremble with excitement or the like; be in a flutter. 5. to express or utter by twittering. 6. an act of twittering. 8. a state of tremulous excitement. Although the primary meaning people associate these days is that of a bird, it cannot be denied that “twitter” also means “to talk lightly and rapidly, esp. of trivial matters; chatter“. The fact it is now done over the Internet matters not in the same way that one can “talk” or “chat” over it (and telephones for that matter) despite the technology not existing when the words were conceived. Had “twitter” have tried to obtain a monopoly over a more common words like “chatter” and “chat” there’d have been hell to pay, but that’s not to say they should get away with it now. Let’s leave the definition at that for now as twitter have managed to secure registration of their trademark (which does not imply that it is enforceable). The point is that this is the weakest type of trademark already and some (including myself) would argue that it a) should never have been allowed and b) will be impossible to enforce. To make matters worse, Twitter itself has gained an entry in the dictionary as both a noun (“a website where people can post short messages about their current activities“) and a verb (“to write short messages on the Twitter website“) as well as the AP Sytlebook for good measure. This could constitute “academic credability” or “trademark kryptonite” depending how you look at it. This brings us to the more pertinent point, trademark enforcement, which can essentially be summed up as “use it or lose it”. As at today I have not been able to find any reference whatsoever, anywhere on twitter.com, to any trademark rights claimed by Twitter, Inc. Sure they assert copyright (“© 2009 Twitter”) but that’s something different altogether – I have never seen this before and to be honest I can’t believe my eyes. I expect they will fix this promptly in the wake of this post by sprinking disclaimers and [registered®] trademark (TM) and servicemark (SM) symbols everywhere, but the Internet Archive never lies so once again it’s likely too little too late. If you don’t tell someone it’s a trademark then how are they supposed to avoid infringing it? That of course didn’t stop them suspending @retweet shortly after filing for the ill-fated “tweet” trademark themselves, but that’s another matter altogether. The important point is that they don’t claim trademark rights and so far as I can tell, never have. Now that you’re twittering, find new friends or follow people you already know to get their twitter updates too. Wondering who sends tweets from your area? @username + message directs a twitter at another person, and causes your twitter to save in their “replies” tab. FAV username marks a person’s last twitter as a favorite. People write short updates, often called “tweets” of 140 characters or fewer. Tweets with @username elsewhere in the tweet are also collected in your sidebar tab; tweets starting with @username are replies, and tweets with @username elsewhere are considered mentions. Can I edit a tweet once I post it? 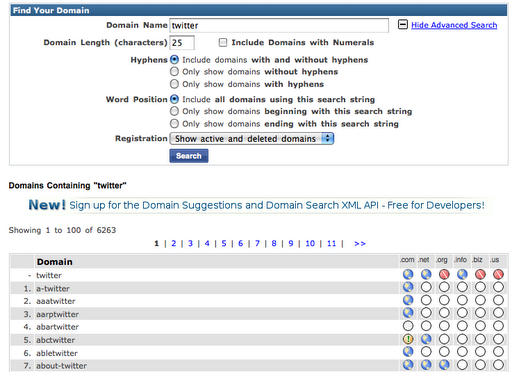 According to this domain search there are currently 6,263 domains using the word “twitter”, almost all in connection with microblogging. To put that number in perspective, if Twitter wanted to take action against these registrants given current UDRP rates for a single panelist we’re talking $9,394,500 in filing fees alone (or around 1.5 billion nigerian naira if that’s not illustrative enough for you). That’s not including the cost of preparing the filings, representation, etc. that their lawyers (Fenwick & West LLP) would likely charge them. If you (like Doug Champigny) happen to be on the receiving end of one of these letters recently you might just want to politely but firmly point them at the UDRP and have them prove, among other things, that you were acting in bad faith (don’t bother coming crying to me if they do though – this post is just one guy’s opinion and IANAL remember ;). I could go on but I think you get the picture – Twitter has done such a poor job of protecting the Twitter trademark that they run the risk of losing it forever and becoming a lawschool textbook example of what not to do. There are already literally thousands of products and services [ab]using their brand and while some have recently succombed to the recent batch legal threats they may well have more trouble now that people know their rights and the problem is being actively discussed. Furthermore, were it not for being extremely permissive with the Twitter brand from the outset they arguably would not have had anywhere near as large a following as they do now. It is only with the dedicated support of the users and developers they are actively attacking that they have got as far as they have. We have applied to trademark Tweet because it is clearly attached to Twitter from a brand perspective but we have no intention of “going after” the wonderful applications and services that use the word in their name when associated with Twitter. However, if we come across a confusing or damaging project, the recourse to act responsibly to protect both users and our brand is important. Today’s batch of microblogging clients are hard wired to Twitter’s servers and as a result (or vice versa) they have an effective microblogging monopoly. 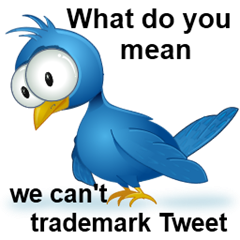 Twitter, Inc has every reason to be happy with that outcome and is naturally seeking to protect it – how better than to have an officially sanctioned method with which to beat anyone who dare stray from the path by allowing connections to competitors like identi.ca? That’s exactly what they mean with the “when associated with Twitter” language above and by “confusing or damaging” they no doubt mean “confusing or damaging [to Twitter, Inc]”. Distributed social networking and open standards in general (in the traditional rather than Microsoft sense) are set to change that, but not if the language society uses (and has used for hundreds of years) is granted under an official monopoly to Twitter, Inc – it’s bad enough that they effectively own the @ namespace when there are existing open standards for it. Just imagine if email was a centralised system and everything went through one [unreliable] service – brings a new meaning to “email is down”! Well that’s Twitter’s [now not so] secret strategy: to be the “pulse of the planet” (their words, not mine). Don’t get me wrong – I think Twitter’s great and will continue to twitter and tweet as @samj so long as it’s the best microblogging platform around – but I don’t want to be forced to use it because it’s the only one there is. Twitter, Inc had ample chance to secure “twitter” as a trademark and so far as I am concerned they have long since missed it (despite securing dubious and likely unenforceable registrations). Now they need to play on a level playing field and focus on being the best service there is. Update: Before I get falsely accused of brand piracy let me clarify one important point: so far as I am concerned while Twitter can do what they like with their logo (despite continuing to give it away to the entire Internet no strings attached), the words “twitter” and “tweet” are fair game as they have been for the last 700+ years and will be for the next 700. From now on “twitter” for me means “generic microblog” and “tweet” means “microblog update”. If I had a product interesting enough for Twitter, Inc to send me one of their infamous C&D letters I would waste no time whatsoever in scanning it, posting it here and making fun of them for it. I’m no thief but I am a fervent believer in open standards. 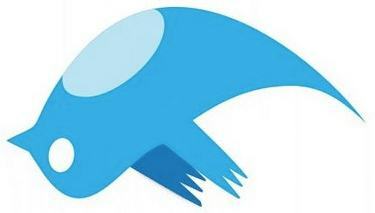 CNET News: Is Twitter freaking out over ‘tweet’ trademark? LA Times: Will Twitter trademark ‘tweet’ before it’s genericized? What they failed to mention though was that according to USPTO records (#77715815) not only had they actually applied some months before (on 16 April 2009) but that their application had been refused that very same day (1 July 2009). Now I may not be a lawyer (I did play a role in overturning Dell’s “cloud computing” and Psion’s “Netbook” trademarks) but given all three of the marks identified look like proceeding to registration (it only takes one to rain on their parade), it’s my non-expert opinion that Twitter has a snowflake’s chance in hell of securing a monopoly over the word “Tweet”. That’s too bad for Twitter but it’s great news for the rest of the community as it’s one less tool for locking in Twitter’s rapidly growing microblogging monopoly. People do use the word “tweet” generically (including with non-Twitter services) and if Twitter, Inc. were successful in removing it from the public lexicon then we could all suffer in the long run. In any case it is neither serious nor safe for one company to become the “pulse of the planet” and that is why I will be following up with a series of posts as to how distributed social networking can be made a reality through open standards (if that stuff is of interest to you then subscribe and/or follow me for updates). I’ve also got some interesting things in the pipeline in relation to standards and trademarks in general so watch this space. Anyway it just goes to show that with trademarks you need to “use it or lose it”. The “propagation delay” of the media has dropped from months at the outset to near real-time today so companies need to move fast to protect their marks or lose them forever. As for whether the 1 July post was a scramble to protect the mark on receipt of the USPTO’s denial, whether the USPTO was acting in response to it, or whether it was just a coincidence and particularly bad timing I don’t know. I don’t really care either as the result is the same, but I would like to believe that the USPTO is becoming more responsive to the needs of the community (after all, they revoked Dell’s cloud computing trademark in the days following the uproar, despite having already issued a “Notice of Allowance” offering it to them). Update: It turn out that USPTO most likely acted in response to Twitter’s 10:37am blog post as (after months without action) they conducted an XSearch at 8:30pm and sent the rejection notice at 9:00pm. I’d chalk that up as a FAIL for Twitter and a WIN for the USPTO. Update: See also: The Inquisitr: No Tweet trademark for Twitter, complete with the hilarious graphic at the top (used without permission but with thanks to the creative genius at The Inquisitr). Update: See also: CNET News: Not so fast, Twitter: ‘Tweet’ isn’t yours, which is a good, balanced, albeit unsourced article.